Turkey is looking forward to welcoming all media representatives to Antalya for G20 Leaders Summit, which will take place on 15th and 16th of November 2015. Turkish Presidency is committed to facilitate a wide media coverage of the Summit and a pleasant stay for all media representatives. 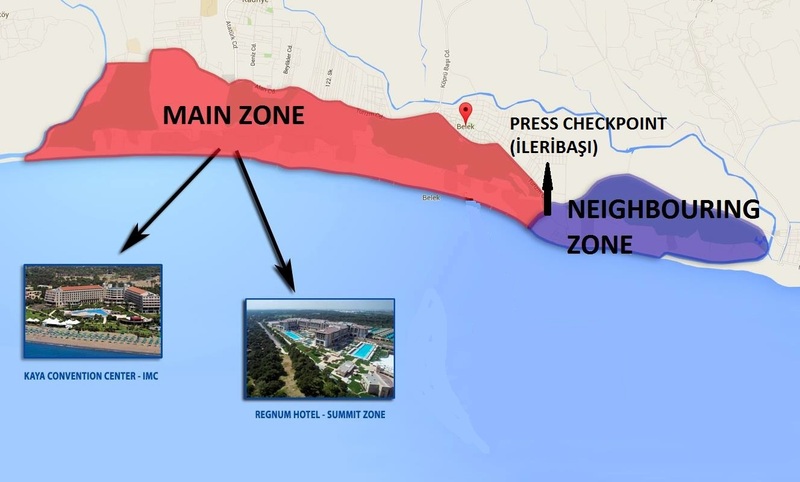 A purpose-built International Media Centre (IMC) is set up at the designated media hotels Kaya Palazzo and Kaya Belek to provide support and facilities to media representatives covering the G20 Leaders Summit. It will also be the site of news conferences, including by the Leaders. The IMC will be operational from 08:00 Thursday 12 November to 12:00 Tuesday 17 November on a 24-hour basis. This Media Advisory Note intends to provide all fundamental information on the logistical arrangements of the Summit. Information in this Advisory Note is current as of November 1st 2015. Any amendments to this Note will be announced on G20 official website (www.g20.org) and IMC Twitter account (@g20summitmedia). All media representatives who will cover the G20 Leaders Summit and utilize the dedicated media facilities at the International Media Centre (IMC) must be accredited. Registration for media accreditation is closed on 31 October 2015. There will be no further extensions to this deadline. All accredited applicants will be notified individually once their evaluation processes are completed. All accredited media representatives are required to collect their accreditation passes at the Media Accreditation Centre at Antalya Airport. Media Accreditation Centre, which is located at Terminal 1, will be operating from 08:00 Tuesday 10 November to 16:00 Monday 16 November, on a 24-hour basis. An internal shuttle service to the Media Accreditation Centre will be provided for those media representatives arriving at Terminal 2. Please note that the accreditation passes can only be collected at the Media Accreditation Centre at Antalya Airport. At Media Accreditation Centre, all media representatives are required to present their national identification cards (passports for international media representatives) and originals of their official documents (press cards or letters of assignment) submitted online, before they can collect their accreditation passes. Only the media representatives who have received confirmation to their online accreditation requests will be able to cover the Summit. Applications submitted after the accreditation deadline, 31 October 2015, will not be taken into consideration. All accredited media representatives will be given “yellow press accreditation badges”, which provide access to the International Media Centre (IMC) located within the Main Zone. Yellow badge holders will be able to benefit from all the facilities provided at the IMC. Please note that yellow badges provide access only to the IMC within the Main Zone. For those events inside the Main Zone but outside the IMC, there will be different procedures applicable and secondary passes might be required. Digital Satellite News Gathering Vehicles (DSNG) are required to be accredited in order to access the Main Zone. The accreditation passes for vehicles will also be collected at the Media Accreditation Centre. Please note that there will be detailed security checks for those vehicles at the Check Point located at the entrance of the Main Zone. Media representatives requiring visa to enter Turkey for the G20 Leaders Summit will, following completion of their online accreditation, receive their automatically generated “G20 Accreditation Certificates” by e-mail. Upon presentation of these Certificates at the Customs (passport control desk), media representatives will be issued their visas to enter Turkey free of charge. Kaya Palazzo Hotel and Kaya Belek Hotel, which are located in the Main Zone and at the closest proximity to the Summit Zone (Regnum Carya Hotel), are designated for the accommodation of the media representatives. Please note that other hotels located in the Main Zone are reserved for the delegations. There will be regular “Airport Press Shuttle” services available for all accredited media representatives from Antalya Airport to the Press Check Point (İleribaşı) at the entrance of the Main Zone. Please note that only those press members with valid accreditation passes will be allowed on the Airport Press Shuttles. All accredited media members will be subject to security checks at the Check Point at the entrance of the Main Zone and are required to transfer to “Main Zone Internal Shuttles” together with their equipment. Airport Press Shuttle service will operate from 9 to 17 November. 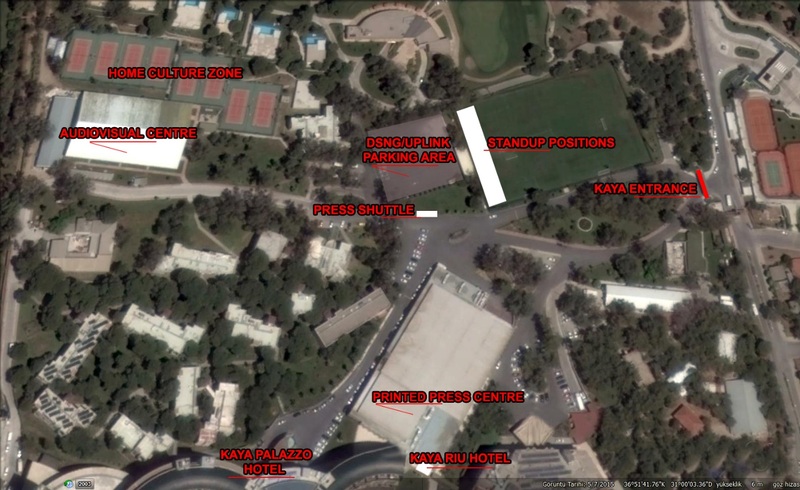 “Main Zone Internal Shuttles” will operate between the Check Point and the IMC (Kaya Hotels) from 11 to 17 November. Those accredited media representatives staying outside the Main Zone are expected to make their transportation arrangements on their own until the Check Point (İleribaşı). Media representatives who request transportation services within the Main Zone, in order to follow media events other than the official programme of the Summit (including certain parts of the Spouses’ Programme) are required to refer in advance to the relevant info desks located at the IMC. Please note that these requests will be accommodated depending on capacity. G20 Leaders Summit will be held at the Regnum Carya Hotel Convention Centre. The Official Welcome Ceremony will begin at 12:00 hours on Sunday, November 15th. It will be followed by a working lunch and a family photo. Leaders will have a working session in the afternoon. A Reception and Cultural Performance with the participation of Leaders’ Spouses will be held on Sunday evening, November 15th, which will be followed by a working dinner. On Monday, November 16th, the Leaders programme will begin with a working session followed by a working lunch. The Summit will end at around 15:00 hours. The press conference of H.E. Recep Tayyip Erdoğan, President of the Republic of Turkey, will be held at 15:30 hours. At the press conference, there will be simultaneous interpretation in 7 languages (English, French, German, Russian, Chinese, Spanish and Arabic). In line with the established practices of G20 Summits, only certain parts of the Summit programme, such as Official Welcoming Ceremony, Family Photo and Opening Speech, will be open to press. A pool system will be applied to provide access to cover those events. Information on the pool system is detailed at Section 7.1 of this Note and relevant updates regarding the official programme will be made available on CCTV and IMC Twitter account (@g20summitmedia) during the Summit. A purpose-built International Media Centre is set up at the designated media hotels Kaya Palazzo and Kaya Belek to provide support and facilities for media outlets covering the G20 Leaders Summit. The IMC will be operational from 08:00 Thursday 12 November to 12:00 Tuesday 17 November on a 24-hour basis. The accredited media representatives will be able to benefit from the restaurant facilities at Kaya Hotels. Additionally, food and refreshments will be available on a 24-hour basis at the Snack Bars at the IMC. Kaya Palazzo Convention Centre is designated for printed press representatives. The centre has a capacity to serve 2.000 accredited journalists on a 24-hour basis. Different sections of the Convention Centre will be dedicated to printed press representatives and working spaces will be available on a first-come first-served basis. The printed press centre will be equipped with high speed internet access, a number of printers and fixed telephone lines. Latest developments and updated schedule of the Summit events will be transmitted via the CCTV system on the LED&plasma screens as well as on IMC Twitter account (See section 10.2). Kaya Hotels Sports Hall is designated for accredited audiovisual media. There will be over 100 workspaces for TV and Radio broadcast, equipped with all necessary technical infrastructure including ISDN lines and fixed telephones. The audiovisual media centre (IBC) will be equipped with high speed internet. There will be a shared 10 GB internet across the IBC. Every workspace will have an internet drop to the shared connection. Latest developments and updated schedule of the Summit events will be transmitted via the CCTV system on the LED&plasma screens as well as on IMC Twitter account (@g20summitmedia). Please note that, those audiovisiual media representatives who will be using ISDN BRI lines are required to bring their NT-1 equipment with them. The Master Control Rooms (MCR) of TRT, the Host Broadcaster (HB), and EBU, its partner for international broadcastings, will be located at the IBC. Host Broadcaster TRT event coverage will be in European standard of HD 1080/50i. All signals generated by the HOST will be in this format and will contain embedded audio channels of natural sound and translation audios, when available. In order to ensure live broadcasting facilities to the media representatives, 50 standup positions will be available at the Football Pitch of Kaya Hotels, with an ideal background view of the Summit Zone as well as the flags of the participating countries. The standup positions will be equipped with electricity and basic cable connections. Internet connection will also be available at the standup positions. Out of 50 standup positions, 10 will be reserved for EBU, 5 for TRT. EBU will take bookings for its own ad hoc live outdoor positions. The allocation of the remaining 35 standup positions will be managed by the G20 Media Team (See section 9.1) depending on availability. For bookings please send your requests to SummitMedia@g20.org.tr by 10 November 2015. A parking area is designated for Digital Satellite News Gathering (DSNG) Vehicles, located between the Standup Positions and Audiovisual Media Centre. For reserving a parking lot for the DSNG vehicles, please submit your applications via summitmedia@g20.org.tr by 10 November 2015. Please note that there will be a limited amount of parking available for satellite trucks. Press conferences will take place at the IMC from 12 to 16 November 2015. Information on the schedule of the press conferences will be available at the “Briefing Rooms Coordination Desk” and on the TV screens at the IMC. Six press briefing rooms will be made available at the Convention Centre on reservations basis. Each three large briefing rooms have capacity up to 300 people, the smaller rooms have capacity up to 100 people. There will be one main “Press Info Desk” at the entrance of the Kaya Convention Centre, where general enquiries can be referred to. Additionally, there will be four issue-specific media help desks at the IMC. Accredited media members will be able to cover every aspect of G20 Leaders Summit, except for those events which are “closed to press” in line with the established practices of the G20 Summits. For those “closed to press” events, all accredited media will be able to access to the audiovisual content produced by the Host Broadcaster “Turkish Radio and Television Corporation” (TRT) and the photos captured by the Host Photographer “Anadolu Agency”. Turkish Radio and Television is the Host Broadcaster of the G20 Leaders Summit. TRT will produce the live pool signal of the arrivals at the airport, arrivals at the Summit Zone, welcoming, opening speech, family photo and on other relevant occasions as the main media events during the Summit. The broadcast format will be HD 1080i/50(PAL). TRT will provide the pool signal of the all above mentioned LIVE events to TURKSAT 4A. The satellite parameters will be announced in due time. Please follow the updates on the official G20 website. TRT will upload all the above-mentioned events’ edited versions along with the possible ENG coverage such as bilateral meetings on an FTP file titled “G20 TURKEY 2015″ accessible to all media. Access details to FTP will be announced in due time. TRT will provide the LIVE signals as well as edited ENG material from different locations to EBU’s MCR. EBU will distribute the TV and Radio editing cabins in the Sports Hall. The photographs will be available for use with attribution to “G20 Turkey 2015”. The pool images provided by Anadolu Agency has open-access to all. The images will be available without logo, in different sizes, with English subtitles and free of charge. Anadolu Agency’s team of professional photojournalists will also capture the side events and summit preparations in Antalya. Arrivals, welcoming, opening speech, family photo, the reception, press conferences, associated meetings, departures and other relevant occasions will be among the captured content. Host Broadcaster (HB), TRT event coverage will be in European standard of HD 1080/50i. All signals generated by the HOST will be in this format and will contain embedded audio channels of natural sound and translation audios, when available. EBU will provide the distribution of HOST signals to TV and Radio workspaces at the IBC. Broadcasters who require the HB signals in their workspaces should contact Eurovision who will provide a matrix routing panel offering push button selection of both original HD 1080/50i and down-converted SD SDI 576i signals (rates apply for this service). Summit Programme will include “limited access events”, “open to press events” and “closed to press events”. All Working Sessions of the G20 Leaders Summit will be closed to media. In line with the established practices of G20 Summits, media pools will be arranged for certain media coverage opportunities which are subject to space, security and protocol restrictions. Pool accreditation applications for restricted-access events should be submitted to summitmedia@g20.org.tr until 12 November 2015. A limited number of cameramen and photographers will be able to access to those events. Announcements on pool information will be made on 14 November 2015 at the IMC. Pool 1, Pool 2 and Pool 3 access will require three different colors of vests which will be distributed at the “Pooled Events Desk” located at the IMC prior to the above-mentioned events. Pool 1, Pool 2 and Pool 3 vest holders will be accompanied by G20 Media Team and security staff from the IMC to the Summit Zone. Following the pooled events, the media representatives will be immediately accompanied back to the IMC. The Host Broadcaster and the Host Photographer will be included in every pool with their footage and photographs, which will be made available at the IMC. All press conferences will be open to media representatives depending on the capacity of the press briefing rooms. Host Broadcaster (TRT) and Host Photographer (AA) will be present at the press briefing rooms at all times. TRT will produce live pool signals for up to three press conference rooms simultaneously at the Convention Centre. 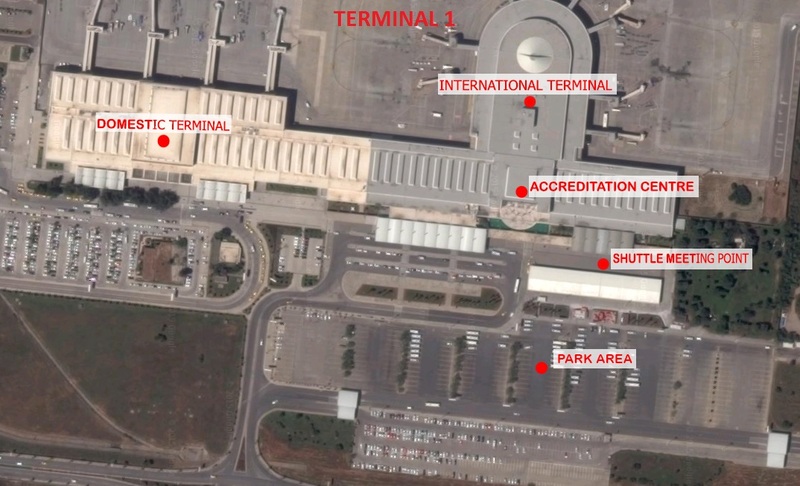 Due to security arrangements put in place for the Leaders arrival at Antalya Airport, no media representative will be able to broadcast or capture the arrival and departure of delegations, except for the Host Broadcaster and the Host Photographer. The official cameramen and photographers of the Leaders accompanying their delegations will be allowed to capture the arrival and departure of their Leaders. A number of rooms have been designated for bilateral meetings of the Leaders at Regnum Carya Hotel (Summit Zone). Due to the security restrictions and capacity of the rooms at the Summit Zone, the access of media representatives will be very limited. Host Broadcaster (TRT) and Host Photographer (AA) will be present at some of the bilateral meeting rooms depending on their capacity. The official photographers and cameramen of the Leaders will be provided limited access to the bilateral meeting rooms. For bilateral meetings of the Leaders outside the Summit Zone, media representatives are requested to refer to the “Bilateral Meetings Desk” at the IMC. These arrangements will be made in coordination with Delegation Media Contacts (DMCs) of the relevant delegations. 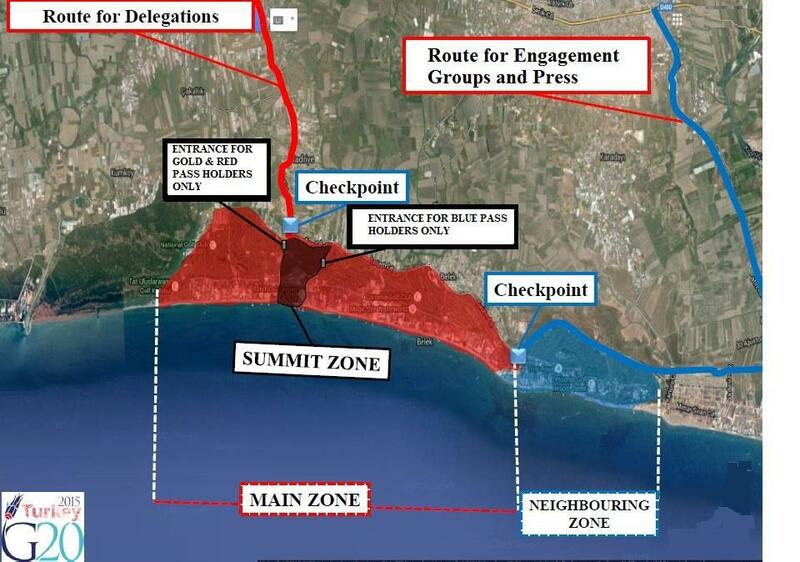 All security measures for the G20 Leaders Summit in Antalya will be taken by the Turkish National Police. Leaders, Heads of International Organizations, delegates, media representatives and guests will be protected at the highest level during the Summit. Upon arrival at the G20 Main Zone, all accredited media representatives will go through security screening and accreditation badge check at the Main Zone Media Check Point (Security screening for the equipment and frisk search for media members). These security checks will be applicable for each entry into the Main Zone. The Summit Zone is designated as a media restricted area and accordingly any entry of media representatives for pooled events will also be subject to security (screening and frisk search) and accreditation badge check. Each delegation will appoint a Delegation Media Contact (DMC) who will be the first point of contact for delegation media administration, media requests and media enquiries before and during the Summit and related events. Media representatives are expected to contact the DMCs via relevant press help desks at the IMC. The G20 Turkey smartphone application will contain information on the Summit including the programme, transport arrangements, venue maps and information about Antalya. The App will be available for free download from the Apple App Store for iPhone and iPad users and the Google Play Store for Android users. Please search for “G20 Antalya Summit”. Wireless internet access is available throughout the Main Zone. Free Wi-Fi service will be available at Regnum Carya Hotel and at the IMC. At Kaya Hotels next to the IMC Audiovisual Centre, a cultural zone called “HOME” will host representatives of the media, the delegations and the engagement groups from 13 to 16 November. Guests will enjoy a rich cultural programme including Turkish music, art and history. They will also have a chance to taste some of the delicacies of the Turkish cuisine and the Turkish coffee. During interactive workshops hosted by artisans, visitors will experience traditional Turkish handcraft artefacts which will also be displayed in mini exhibition areas. “HOME” Culture Zone will be open from 14:00 on 13 November till 14:00 on 16 November. Daily hours of operation will be from 10:00 till 22:00. There will be 24-hours health service available at all G20 venues. There will also be fully equipped ambulances (with a medical doctor and two paramedics) ready at all G20 venues during the Summit, including Kaya Palazzo and Kaya Belek Hotels, where the IMC is located. Medical emergency call number is 112. Antalya is the largest city on the Mediterranean coast of Turkey, situated at the slopes of the Taurus Mountains. The city is rich in scenic beauties and historical monuments. Antalya is one of the leading tourism destinations in the world with palm-lined streets, historic castles and colourful neighbourhoods. It offers richly diverse opportunities for visitors, including shopping, beautiful parks, high quality restaurants and a picturesque marina. Belek is a popular resort town to the South-East of Antalya and is famous for its pristine 17 km. coastline and world-class golf clubs. With its prevailing Mediterranean climate, winters are temperate and rainy; summers are hot and dry in Antalya. The mild Mediterranean climate continues until November. Average temperatures into the late autumn range between 15 and 24°C. Daily temperatures in November range between 10°C and 21°C with a reasonable probability of rain. Turkey is in the Eastern European Time (EET) Zone (GMT/UTC + 2 hours). The country code for Turkey is 90. The city code for Antalya is 242. To make an international phone call from Turkey, dial 00 + country code + phone number. The electricity supply in Turkey is 220 volts AC 50 cycles. Electric appliances must have European plugs (i.e. round-tipped, two-pinned). An international adapter is recommended. The official currency in Turkey is the Turkish Lira and is available in the following denominations: banknotes: 5, 10, 20, 50, 100 and 200 TL; coins: 5, 10, 25, 50 kuruş and 1 TL. Cash can usually be exchanged without commission at exchange offices, banks and hotels. Cash machines (ATMs) are available throughout Turkey, accepting major credit and bank cards and instructions are often available in English. Within Turkey for emergencies (ambulance, police and fire) media representatives should dial 112. Smoking is not permitted in public places in Turkey including meeting venues and the IMC.